Pliable's second law of music says you can measure the worth of a composition by the number of paths it opens. In which case Latvian composer Ēriks Ešenvalds Passion and Ressurection is a pretty worthy piece. Yesterday it sent us to Castel del Monte in Italy for jazz/classical fusion. Today it sends us to a country that like Latvia was once under Soviet control, for a truly great and inexplicably neglected Requiem. 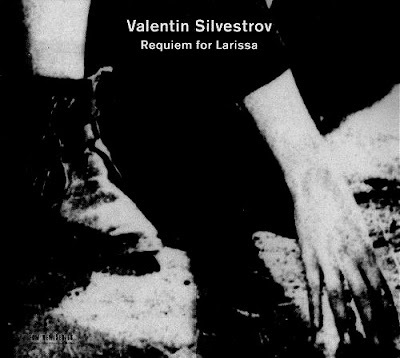 Valentin Silvestrov, whose Fifth Symphony has already featured here, was born in Kiev in Ukraine in 1937 and composed his Requiem for Larissa between 1997 and 1999 in memory of his wife the musicologist Larissa Bondarenko. It is familiar because it sounds so right. Music written from the heart as opposed to written to catch the prevailing wind of stylistic fashion will always sound right. Silvestov's creative destiny for many years has been the postlude: his works revive past music, especially Romantic symphonic music, in the very act of lamenting its disappearance. But again like Passion and Ressurection Silvestrov's Requiem for Larissa is not music of the past. This remarkable work, scored for mixed choir and orchestra including synthesizer and piano, is timeless. For me the Largo fourth movement, which develops the setting of verses by the Ukrainian national poet Taras Shevchenko heard in the composer's Silent Songs (1974-77), is among the most moving music ever written, irrespective of period. We are fortunate that Valentin Silvestrov's Requiem for Larissa is given the performance and recording* it deserves by the National Choir of Ukraine "Dumka" and National Symphony Orchestra of Ukraine conducted by Volodymyr Sirenko on the ECM CD seen above**. Last year I pleaded "no more masterpieces please" to no avail as we now have "major masterpieces". However, I am not going to apply the m word to Requiem for Larissa. Instead I am going to apply two other words - buy it. * Production is by Radio Ukraine team of Arkady Vichorev and Valery Stupnitsky, executive producer is, as ever, Manfred Eicher. Although Requiem for Larissa was released by ECM in 2004 it was recorded in 2001 in an unspecified venue in Kiev. ** The image on the ECM Requiem for Larissa CD cover is a still from "Histoire(s) du cinéma" by Jean-Luc Godard. The soundtrack, which has what must be the most eclectic composer credits ever, was released by ECM as a 5 CD set. Now follow the Passion and Resurrection path to Rudolf Mauersberger's 1961 Dresden Requiem. I could could find no biographical links to the musicologist Larissa Bondarenko, hence no link. Reader discoveries as ever welcome. A reader has just emailed having found out what I also discovered. There is an Uzbekistan supermodel called Larissa Bondarenko. The Silvestrov ECM recording I find most affecting and I return to most often is the 2 CD set Silent Songs. Interestingly, one of those rare ECM releases that is actually a release of an earlier non ECM recording. On a similar path, Jansung Kakhidze's "The Moon Over Mtatsminda" (released on Jan Garbarek's Rites) never fails to move me to tears. Sticking to this path, the Jimmy Giuffre ECM re-issue is another favourite. TMH, I would totally agree with you about the ECM discs of Silvestrov's Silent Songs - quite magical. Isn't it interesting how the same names seem to keep coming up - Silvestrov, Garbarek etc? I took Jan Garbarek's Madar with me to Morocco on my iPod and was fascinated to find pirate copies of it all over the souks. Before your email arrived I was reflecting on how art music seems to be splitting into parallel universes. On the one hand there is the BBC Radio 3 specialist chart with André Rieu etc. On the other hand there is all this gorgeous stuff from ECM, Enja etc. The two never seem to meet. Which is probably a very good thing. I agree totally with the comments about Requiem for Larissa. Ikon for string quartet on the cd A Place Between. That must be one of the most gorgeous piece of music written. Sorry I love him.. I could go on.. Pliable, I can report that the National Symphony Orchestra, of Washington, under the young Ukrainian guest conductor Kirill Karabits, will be performing Silvestrov’s ‘Elegy for Strings’ next January at the Kennedy Center. I am pretty sure that it is the first Silvestrov work ever performed at the Center. I don’t know this work, but I see that it was recorded on the Con Legno label, in 1990, under Arvo Volmer and the Estonian State Orchestra. I also see that Silvestrov won the International Serge Koussevitzky Prize in Washington, D.C., back in 1967; and in that year he composed both an ‘Elegy’ and a ‘Hymne’ for 5 ensembles! I will be curious to learn whether it was 44 years between Silvestrov winning the Koussevitzky Prize and the first performance of a work by him in Washington. All best. It needs to be mentioned that Requiem for Larissa recording was nominated for a Grammy in 2004 (and in my opinion should have won). A very moving work indeed.